This is the perfect solution for those looking to add more seat pressure for higher revs and larger cams in the UZ engine (non-VVTi and VVTI versions included). This single wound spring will work perfect with the factory retainer and keepers. Coil bind is an immense 550 thousandths. We also have an option to include titanium retainers for a non-VVTi 1UZ. Please note that we currently only have BC retainers for the non-VVTi 1UZ engines. The springs will fit the VVTi and 2UZ engines, however you will either need to reuse the factory retainers, or use the (recommended) full SuperTech kit instead. Please see below for that listing. What does this mean? You can run more cam than the unmodified head will take! This spring is good to over 10,000 RPM with proper supporting mods. Seat pressure on standard 1UZ is 72 lbs, and in VVTi engines is 67 lb. 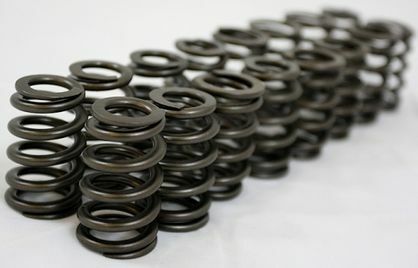 Price is per set of 32 springs, for 1 complete engine.